This is a paid post written on behalf of Jane.com. I will receive a small commission for any purchases made from links in this post. All thoughts are 100% my own. How many times do you look into your closet and find yourself thinking... "I have nothing to wear!" That was me about a year or so ago. I may have had a closet full of clothes, but I could not stand to look at any of them. I knew it was time for a change. In my typical bargain shopping way, I first headed to the thrift store. I found a few pieces, sure, but I needed a complete closet overhaul and I found that my local thrift stores just did not have the styles I liked and needed to flatter my body type. Still, I was not about to pay full price for my new wardrobe. Thankfully, Jane.com came to my rescue. Like many, I had known about Jane.com for quite some time, but had not yet taken the plunge to purchase. How would the quality be? Would it take forever to arrive? Would it look like it did in the pictures? There is always a little bit of skepticism when it comes to ordering online for the first time, right? But I put it to the test, and fell absolutely in love. Today I am sharing what I have learned and love about buying from Jane.com! 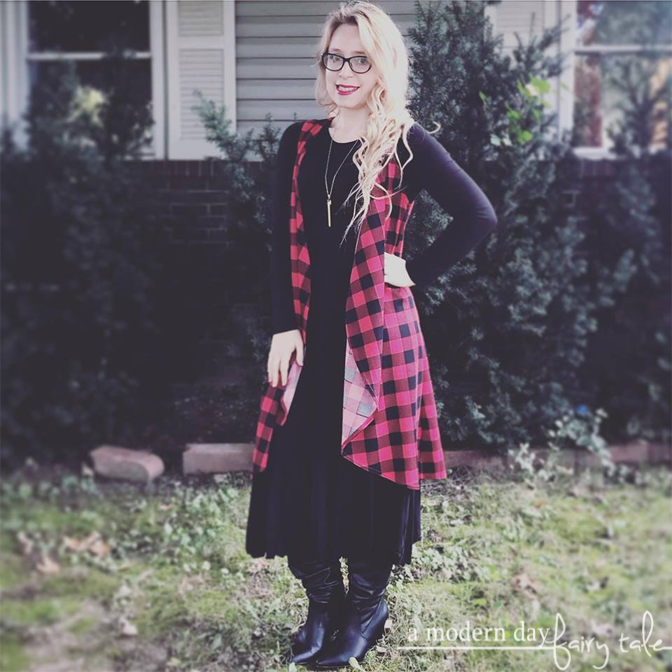 My favorite Jane.com purchase: this buffalo plaid vest. They offer a great variety. With fashions from a large selection of boutiques, there are many great styles to choose from. Simple tees, stunning dresses, even accessories are all covered. They even offer a great selection of kids styles and home decor, etc as well. The inventory is ever changing. Deals on Jane.com usually last just a few days each, with brand new deals being added each and every day. I love that if I don't find just what I'm looking for one day, there will be more to choose from the next. They introduce us to many great boutiques. While some of my new wardrobe was purchased directly from Jane.com, I also purchased directly from boutiques that I had first discovered through them. This is in fact where I discovered my favorite shop Fancy Frill Boutique, who always have a great selection of daily deals on Jane.com! The styles are amazing. That should go without saying, but let's say it anyway. It never fails that I will receive numerous compliments anytime I wear an outfit purchased from Jane.com. And I have always been very pleasantly surprised with the quality. Everything has come just as pictured, and the quality has been great- well worth the cost. The deals rock. Let's be honest, this is really what it's all about, right? The deals! I love the look and feel of boutique styles... but the price? Not as much. My budget agrees with me. With Jane.com I can get the looks I love, with a price tag I can afford. Are you ready to start shopping Jane.com and updating your wardrobe too? There has never been a better time than NOW. Today through February 3, Jane.com is having a Deal Dash event with fantastic deals on a variety of great styles. But hurry, deals only last 24 hours and then they are gone! Head on over now! Your closet will thank you. Have you shopped Jane.com? What was your experience? What deals in the Deal Dash are your favorite? I really like their clothing. They have so many cute and stylsh items. I love your outfit!